Again I ask the Carter Centre to give an answer. Please, go to the site of Venezuela's National Electoral Centre (before they modify any data - even if we have sent copies to the international media) and enter the ID number 19777305. Look at the person's name. Now enter 19777306. Look at the person's name. Full names in a Spanish country usually consist of 4 actual words, two given names and two surnames. A repetition is highly unlikely but for a few very common surnames. The current electoral records have about 20000 repetitions. In thousands of cases the "doubles" are in the same centre, in thousands of cases in another one very around the corner. All those cases have the same birth date. They are just the tip of the iceberg: they are obviously not real. Since we reported that to the CNE there have been thousands of changes...but the changes are about names, not about deletion. They are obviously not kosher. Someone may say "but they are less than 0.1% of the total amount of voters". Indeed, they are, they are less than 40000. Still, they are the most obvious cases. If whoever introduced them also introduced cases with different birthdates, we have no way of knowing unless an independent commission asks a statistically representative amount of people to come forward and identify themselves. Technically, there is nothing more to produce such records if these have been produced already. What do you have to say about this? Is this part of the best electoral system on Earth, as Mr Carter declared? 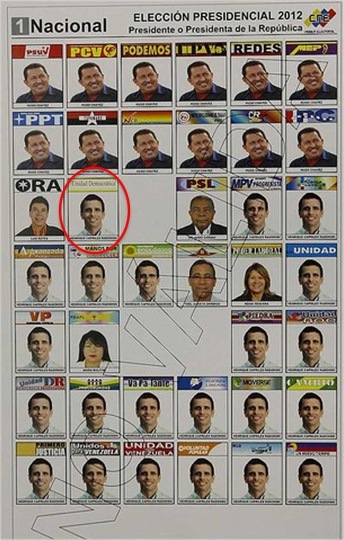 Now something else: why does the best electoral system on Earth has a ballot where voting for one of the boxes with the opposition candidate's face leads to a vote against him? Is the best electoral system on Earth - based on machines with paper trails - going to produce the results much later than such systems as the manual ones in Brazil or Germany? We are sending this post not only to the BBC but also to Spiegel, Le Monde, Novaja Gazeta, etc, etc. Thanks for your answer, Carter Centre. Hi, I'm told that if you tweet Vicente Díaz (@VicenteDz) or Eugenio Martínez (@puzkas) with questions they will respond. Give it a try. I sent him the question but with a link to this post and another one also in English. I might write a post in Spanish and try it again. Thanks.